opportunities to businesses and these actions can achieve significant cost savings whilst reducing a company’s carbon footprint. Consideration of a switch from fossil fuel to biomass steam raising is one change that is gathering momentum and biomass boilers are now firmly in the options mix. Biomass is any solid nonfossil-based organic fuel and includes wood (either grown specifically as a fuel or as waste material), straw, types of grass and many other organic by-products. The lower steam raising flexibility offered by biomass burners compared with that of oil or gas fired alternatives is however a major concern for operators of plant and investment decision makers. The main obstacle to achieving acceptable biomass boiler performance is the inherent slow response to step changes in demand, especially for batch production processes using steam as the heating medium. There are other potential draw-backs effecting energy efficiency and ramping time such as the degree of wetness and variable quality of the fuel, and the consequences are a substantial delay in meeting the demand, loss of pressure and temperature to satisfy process requirements, potential loss of production and risk to product quality. All of these problems may be solved by the inclusion of a steam accumulator in the steam supply system. So what is ‘steam accumulation’? It is the storage (in a pressure vessel) of surplus steam produced at times of low demand for subsequent release to supplement the output of the boiler at times of high demand. Any industrial manufacturing process having a variable demand for steam and where an effective differential exists between boiler and process pressures can benefit from this energy efficient technology. What is the prime benefit? The steam held in reserve is available immediately to meet a step change or rapidly rising demand during the time needed for the biomass boiler to ramp up to the required level of output and conversely the accumulator provides a means to absorb and store the excess steam produced from residual heat in the furnace during ramp down. Where the demand is of a highly fluctuating nature, a steam accumulator provides the means to convert this into a steady load on the boiler. What else can ‘steam accumulation’ achieve? Imagine a boiler able to reach a ‘peak’ demand ten times higher than its rated output. Consider that two out of a bank of three boilers might be eliminated and still allow the remaining boiler to reach the same ‘peak’. Contemplate maintaining a low pressure steam supply whilst diverting boiler output to critical high pressure consumers. These are just three examples of the many applications possibilities for ‘steam accumulation’.The potential benefits are always significantly lower energy costs through increased operating efficiency and can additionally provide immediate response to the steam demand, a secure steam supply at constant pressure, temperature and dryness, elimination of boiler low water lock-outs and priming due to wide load swings, assure product quality, a reduction in emissions and where new steam or power plant is required, lower capital cost. Water is used as the heat storage medium. The reason becomes evident when the greater heat storage capacity of water is compared with that of the same volume of steam vapour at any given state of temperature and pressure. Most accumulators work on the ‘pressuredrop’ principle whereby steam from the boiler is charged into the water causing a rise in temperature (and pressure) and steam for process is discharged from the water (as ‘flash’) at low pressure to meet the demand. The size of the storage vessel depends on the difference in pressure raised in the boiler and that of the pressure required by the process, and the amount of storage required. Storage vessels can range in size from 10m3 to 75m3 in volume (and more), or be a multiple of vessels to overcome logistical problems. Charging of an accumulator takes place when ‘surplus’ or ‘excess’ steam from the boiler is condensed in the water space of the accumulator. This is achieved by directly injecting the steam into the water by means of special charging nozzles and results in a continuous rise in the temperature of the water which continues until the corresponding pressure in the vessel has reached that of the charging steam. Discharging takes place when the steam in the head space above the water is released which causes a momentary reduction of pressure leading to an imbalance of that lower pressure with the saturation temperature of the storage water, whereupon the surface water starts to boil and more steam is released as ‘flash evaporation’ to replace that just released. This process may continue for as long as steam is required to be discharged or until the minimum required by the process has been reached. How can an accumulator benefit boiler sizing? The dangers in oversizing or undersizing a biomass steam boiler are more pronounced than those for fossil fuel fired applications. All boilers reach highest efficiency when operated near rated output and under steady load conditions. However, lower combustion flexibility compared with that of oil or gas fired burners makes the biomass boiler less suitable for meeting a variable demand, seasonal output requirements and low loads. A steam accumulator can add the steaming flexibility that the biomass boiler alone lacks and can reduce the periods during which it operates less efficiently. Variations in fuel quality can be compensated for, repeated shut-downs and start-ups are reduced, load factor is increased, boiler reliability is improved, longevity is increased and emissions are minimised. Steam is an essential commodity for many industrial processes. The technology can be successfully applied in biomass boiler applications to any manufacturing process where steam is used for batch processing or at highly fluctuating rates. These conditions can be found in food production, canning, distilling and brewing, chemical manufacture, textiles, rubber, paper and board, plastics, pharmaceuticals, steel making, laundries, ammunition’s, brick and concrete curing, turbine testing, tyre manufacture, combined heat and power. The latest accumulator control methods are designed to optimise boiler efficiency in conjunction with modern burner technology. Matching the amount of steam stored to burner performance, connecting the storage to the steam supply system in the most effective way, and customising the microprocessor accumulator controls are the keys to a successful installation. 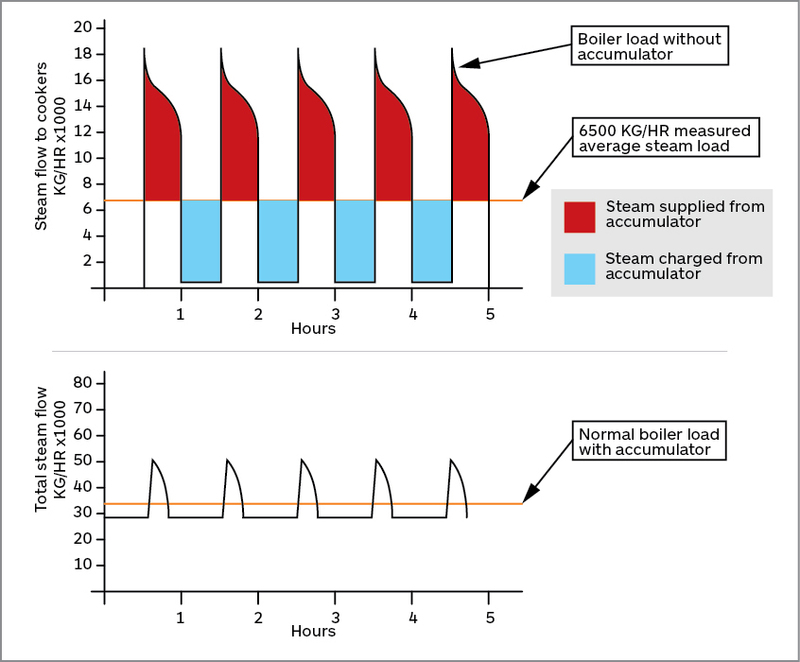 Other than the basic cost of fuel, the most important energy cost savings to be gained from steam accumulation derive from a reduction in the boiler output in combination with load stabilisation. In all cases, there are prospects for energy savings emanating from: the elimination of excess steam generating capacity and part-loading that causes a low load factor, the removal of a rapidly fluctuating demand and idle live capacity that increases standing heat and power losses. Therefore the possibility of a steam accumulator meeting a fluctuating steam demand with a smaller boiler operated at a higher load factor and at constant output with higher efficiency is real. Discusses the potential of steam accumulation in reducing carbon-based fuel consumption and reducing air pollution. Incorporation of steam accumulation in combined heat and power generation; Use of steam accumulator in paper mills; Advantages of steam accumulation in power generation applications. BOSTON, MA, Dec. 1, 2004 (Viewpoint) – The global effects of sustained atmospheric pollution are forcing governments worldwide to introduce measures to limit and ultimately reduce the emission of ‘greenhouse’ gases, particularly carbon dioxide (CO2). Reaching target CO2 reductions will call for contributions from all the major sectors of energy use. Attaining higher efficiency in the use of energy at lower operating cost is a compelling enough preoccupation, but for some government legislation, such as the ‘climate change levy’ and investment tax incentives introduced in the UK in 2001, will be the driving force. As rising fuel prices continue to add to the effect on competitiveness, environmental issues and the acquisition of energy efficient technologies already sit high on the boardroom agenda. One such technology that continues to play an important role in the modern boilerhouse is steam accumulation. While it can often be justified on the grounds of practical advantage alone, its potential to reduce fuel consumption is invariably the carrot that consolidates the case for investment by providing the vehicle for payback. This and legislative measures that limit ‘greenhouse gas’ pollution will now turn the industry’s attention to looking in more detail at ways to achieve sustainable energy prices and emissions reductions. The basic purpose of steam accumulation is to eliminate boiler peak loading by providing a reserve of steam to meet intermittent demands. In the charged condition, the accumulator holds a quantity of steam produced as “excess” steam in the boiler at times of low load. When the demand rises, the accumulator discharges and the steam peak is met from storage rather than from the boiler. Lower consumption of carbon-based fuel will result in lower emissions of noxious gases in equal proportion. By means of load stabilization, steam accumulation enables higher combustion efficiency in the boiler resulting in less fuel being burned. Efficiency improvements can be as high as 5% and modern methods of control figure prominently in achieving this. In many applications, an accumulator would permit the selection of smaller boilers than would otherwise be the case. Capital costs would be lower, standing heat and power losses would be correspondingly lower and further reductions in atmospheric pollution would result — adding further to the environmental and economic benefits. Combined heat and power generation (CHP) is the simultaneous generation of heat (usually recovered as steam) and electricity achieved at much higher levels of energy efficiency than is possible as separate entities. The reduction in fuel consumed enhances the economic case for new build developments while at the same time cutting the potential for environmentally damaging emissions. However, those concerned with the design of CHP plants do not always consider the benefits of incorporating steam accumulation into the steam supply system. The purpose of ‘steam storage’ is to provide the means to convert an erratic process steam demand into a steady load. 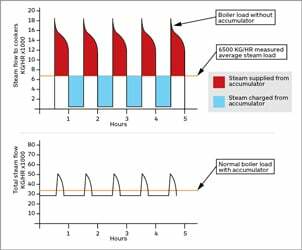 Fluctuating steam demand forces transient operation of the steam generator. This is not conducive to operating at the highest fuel efficiency. It also detracts from optimum sizing of the turbine or engine, which is required for electricity generation. Steam accumulation can provide the answer to marrying these two ideals. The effect of a steam accumulator is to balance load variations, thus reducing or even eliminating the amount of supplementary steam generating capacity that might otherwise be required. The benefits are maximization of boiler load factor, optimization of combustion efficiency, and lower fuel consumption and, therefore, reduced emission of atmospheric pollutants. Moreover, the electrical generator can be sized with the benefit of a steadier heat load and can be run continuously for longer periods at full output. CHP plant ‘trips’ can be the result of sudden load variations imposed by production requirements or due to a malfunction of any of the major power plant components. In the latter case, the cause may be in the prime mover (the gas turbine or engine) or the heat recovery steam generator, or could be due to failure of the gas compressor, loss of fuel supply or a problem with the steam turbine. Whatever the reason, the production of process steam falls rapidly, requiring the standby boilers to fire or, in the case of a stoppage of the steam turbine, its by-pass PRV station to open. It is invariably the case that the standby boilers, supporting auxiliary systems and bypass facilities must be capable of maintaining process steam supplies at maximum demand rate in the event of a CHP plant trip. However, it is also inevitable that steam distribution pressure (and temperature) will be lost because of the inherent lag in auxiliary system response. A steam accumulator can largely remove this problem and practically eliminate it altogether because of its ability to discharge steam instantaneously from the reserve held in storage. Pressure in the steam distribution system is held constant while the standby boilers are given time to run up to full output and the interruptions that would otherwise occur need not be tolerated. A steam accumulator can enable load balancing in paper mills where paper breakages are commonplace. The accumulator provides the means to dump (store) excess steam as the demand plummets, thereby enabling the steam and power generators to be efficiently ‘ramped’ down. The losses associated with steam blow-off to atmosphere or the costs associated with dump condensing are therefore avoided. On start-up, the demand is sudden and the magnitude of peak loads can be far in excess of the normal production demand. These are met initially from the reserve of steam held in ‘storage’ while the generators are gradually run up to match the load. In one paper mill, a steam accumulator provided the solution to CHP ‘trips’, overcoming all the problems the mill had previously experienced in maintaining power and steam production. The accumulator forms part of a CHP plant that comprises a gas turbine exhausting into a water-tube type waste heat boiler. This supplies steam to the accumulator under ‘demand trend regulation’ (DTRS) control, which automatically and continuously regulates the flow of steam into the accumulator (and hence the demand on the boilers) at a constant rate corresponding to the consumption of the paper machine. In addition to stabilizing the load according to production requirements, the control PLC is also configured to provide the means to absorb excess steam generated at times of sudden load cessation. This potential loss of steam to waste is avoided and the stored steam is subsequently used to meet the instantaneous start-up conditions of the paper machine which occur at steam flow rates well in excess of power related generating capacity. Furthermore, the regular occurrence of high and low water ‘lock-out’ of the waste heat boiler under load swings has been eliminated. Previously, these had been the cause of the total loss of boiler steam to all consumers in the mill. These benefits are in addition to the other gains associated with eliminating the variable and transient loading such as those associated with papermaking where response time, process temperatures, and steam quality are paramount. The viability of the case for steam accumulation relies largely on the magnitude of the pressure differential that, together with the required storage capacity, governs the physical size of the storage vessel. Steam storage systems are usually operated on the ‘pressure drop’ principle. Generally, a ratio in excess of 2:1 between charge and discharge pressures would offer the basis for favorable practical and economic arguments to adopt the technology but every application has to be judged on its own merits. Pays for itself within two to three years on average. Savings in fuel and power consumption will depend on the age and condition of the boiler plant, the fuel used and the nature of the load applied. However, improvements in combustion efficiency of 2-5% are attainable and modern methods of control (such as DTRS) could achieve more. As increases in boiler efficiency directly relate to the cost of fuel purchased, then typically an improvement of 5% on an annual fuel bill of $1 million would increase profitability by $50,000 and potentially more. Moreover, a reduction in standing heat and power losses would contribute a further 1-3% depending upon the downsizing of a new boiler plant, or the number of existing boilers closed down, thus adding to the operational savings to be made. Overall annual savings relating to fuel alone might be expected to approach 30% of the capital cost of the installation. Another advantage is that mills would need smaller and/or fewer boilers leading to a reduction in maintenance costs, while less tangible gains such as security of steam supply, stable pressures and temperatures, improved production and better product quality all add to the case for investment. Steam accumulation should be recognized as an energy efficient and widely adaptive technology. It is a real and effective tool for achieving higher operating efficiency, lower energy consumption and reductions in boiler emissions.